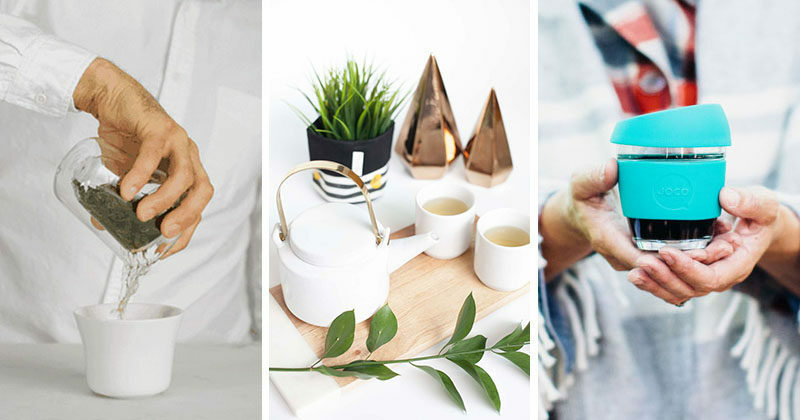 We all know co-workers, friends, and family that drink tea, so we’ve created a gift guide that will help you take their tea obsession to the next level. 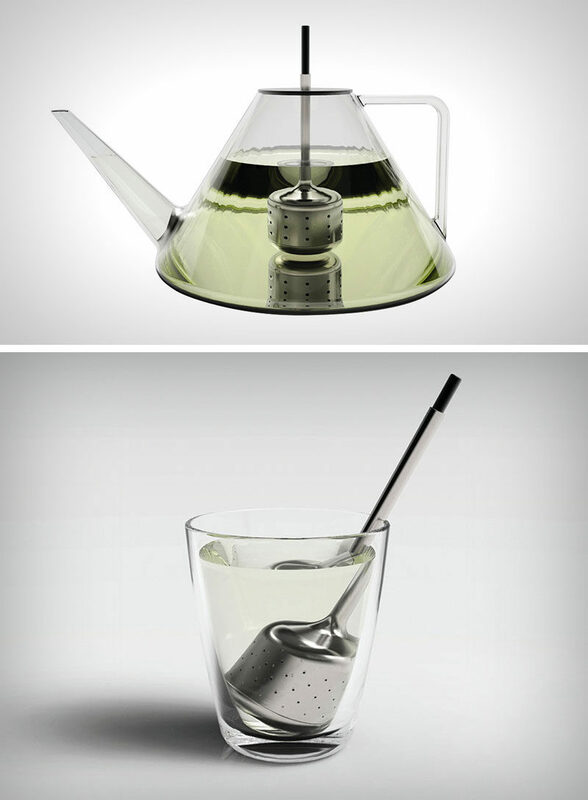 Use a glass tea pot to decide when your tea is strong enough based on the color of the water. 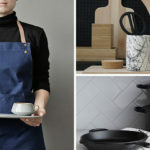 Kettle Teapot designed by Norm Architects for Menu. 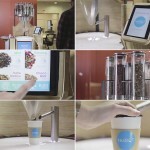 This kettle was designed to perfectly boil just the right amount of water for two people quickly and quietly. 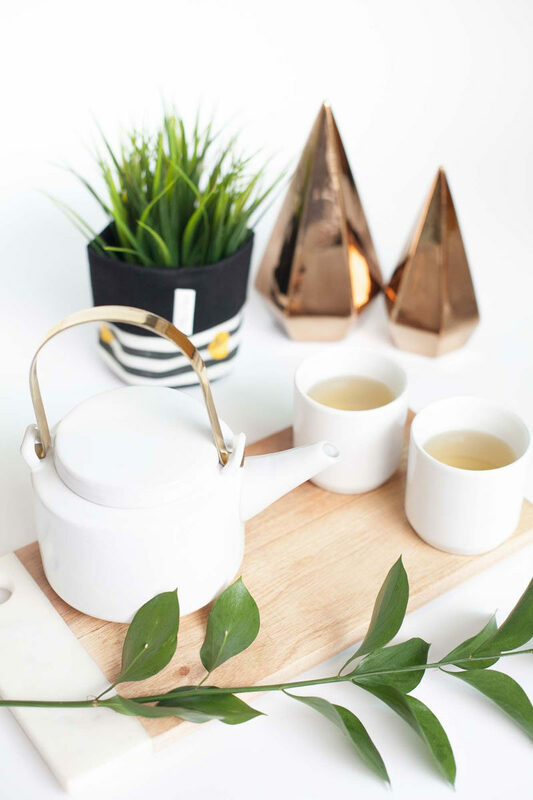 Inspired by playful children’s stories, this tea set plays with shapes and proportions to create whimsical yet modern teapots. 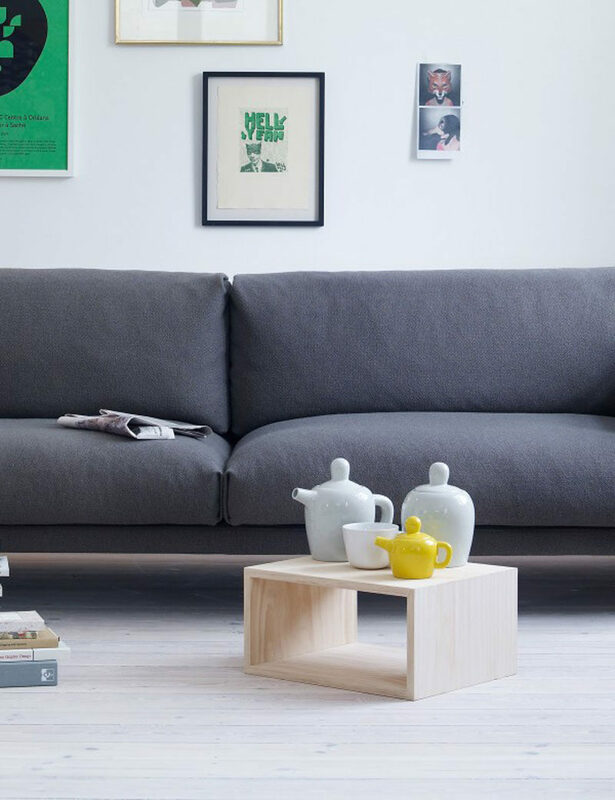 Bulky Tea collection designed by Jonas Wagell for Muuto. 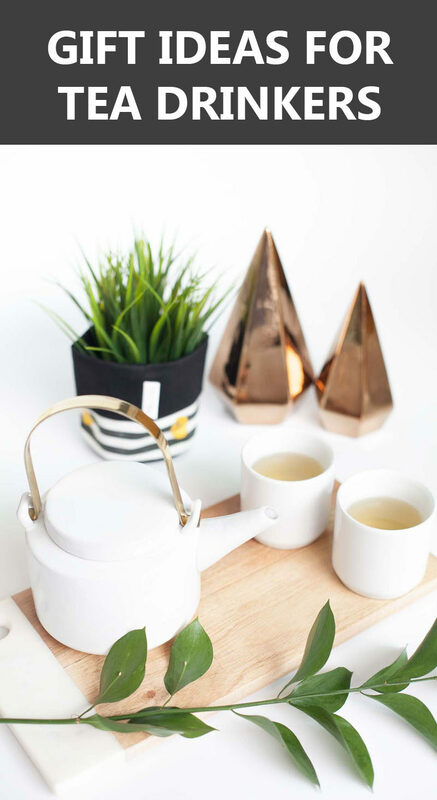 This minimal tea set gives the recipient exactly what they need in order to get their tea obsession started. 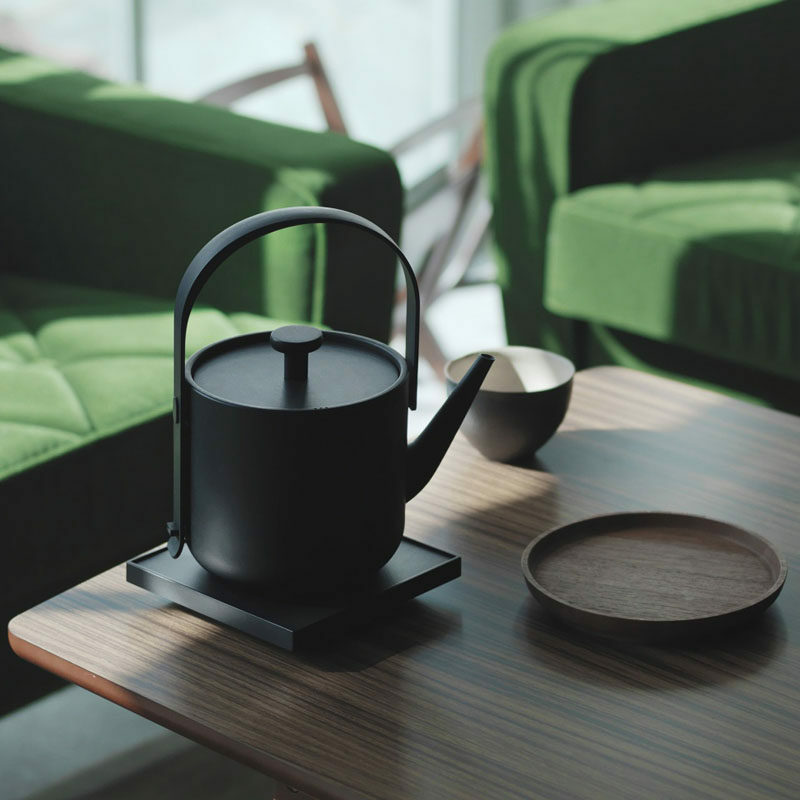 Minimalist Tea Set by Hübsch, available at 3 Little Picks. Soft colors add a subtle touch of fun to these contemporary porcelain teacups and saucers. 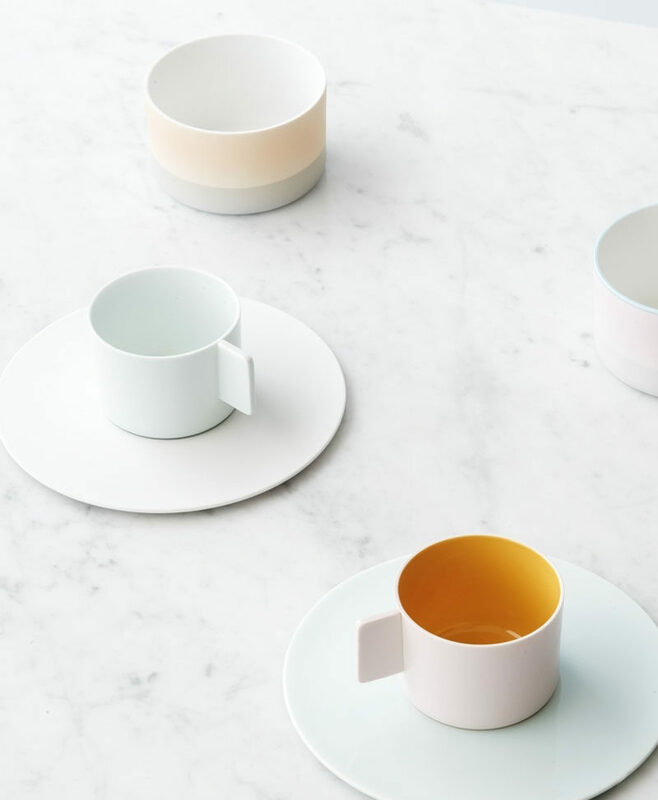 1616 / Arita Japan Coffee Cup designed by Scholten & Baijings, available at Minami. 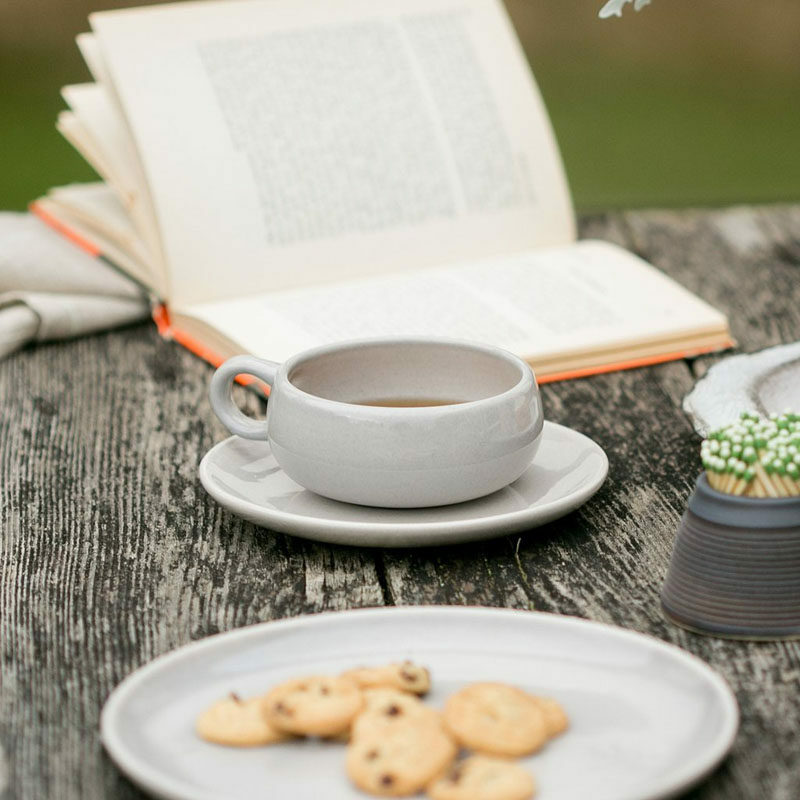 Smooth curved lines and an earthy color palette make these cups and saucers a great choice for people who really like to relax while they sip their tea. 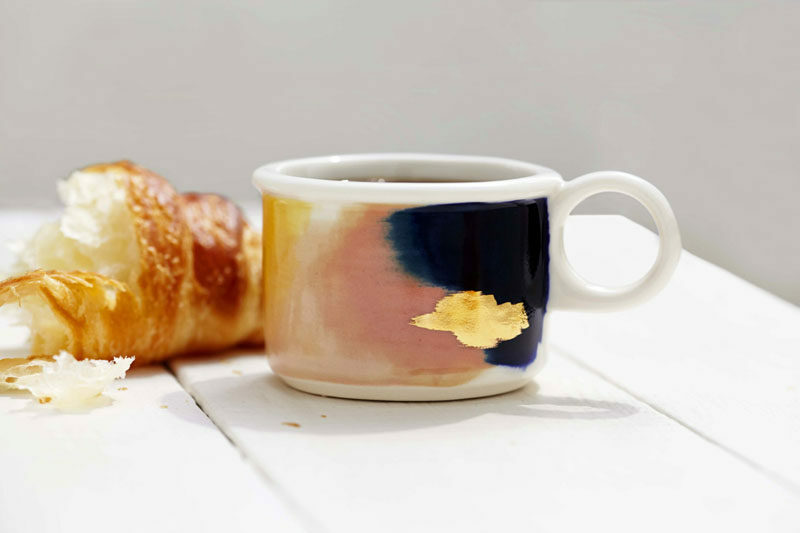 American Modern Cup + Saucer designed by Russel Wright, made by Bauer Pottery, available at Schoolhouse Electric & Supply Co.
Abstract water colors with gold touches create dainty yet modern teacups for the avid tea consumer. Hand painted porcelain tea cup by Red Raven Studios. 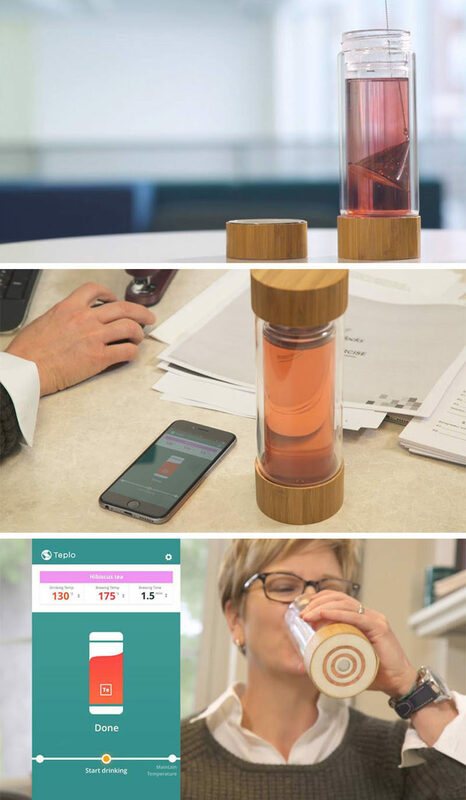 Brew the perfect cuppa using this smart bottle that uses an app on your phone to let you know when the tea is ready and keeps your brew at a set temperature for up to four hours. Find our more about the smart bottle, here. Teplo designed by Load&Road. 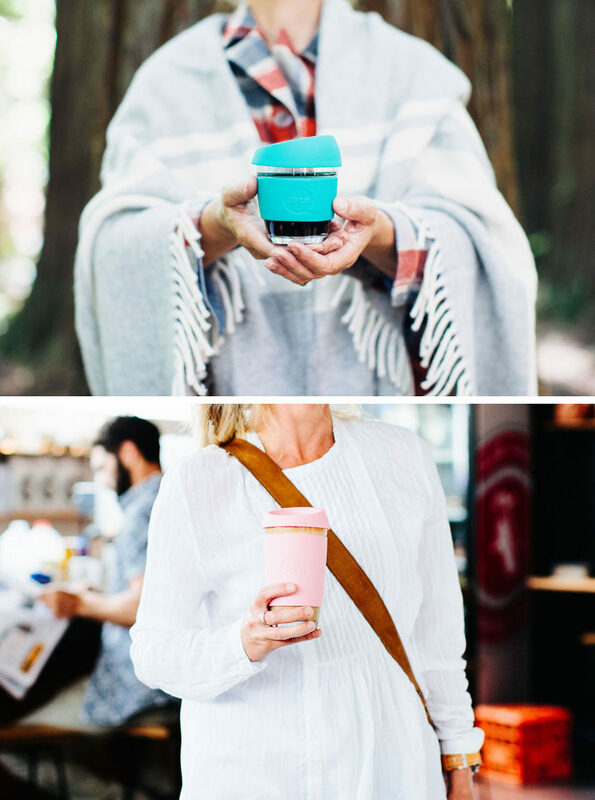 Perfect for people who like to enjoy their tea on the go, these travel mugs are made from thick glass and have insulating silicone lids and sleeves to keep your drink at just the right temperature. 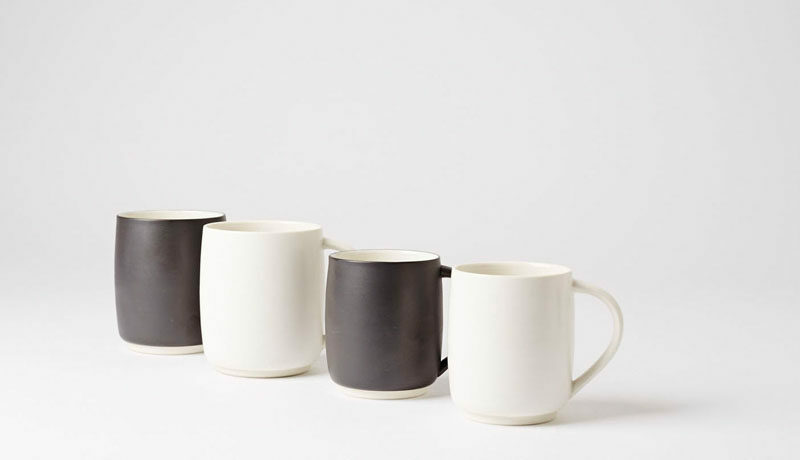 With a matte finish and available in two sizes, these mugs are what minimalist tea lovers dreams are made of. 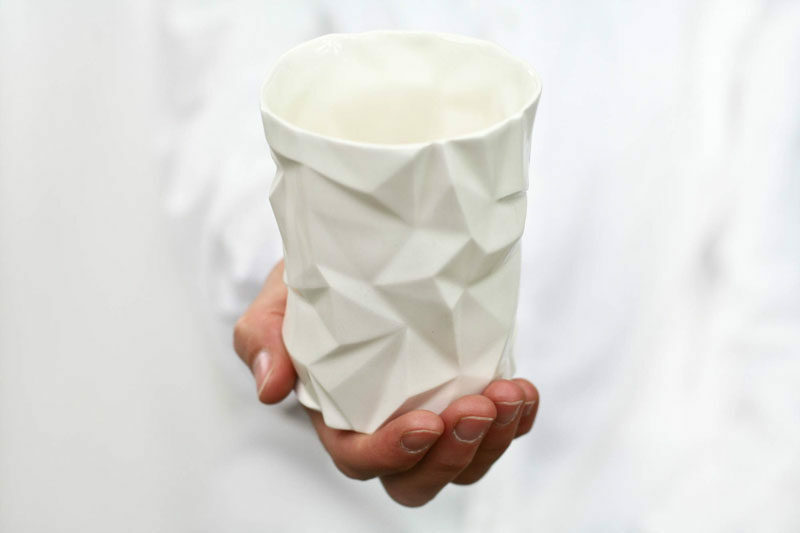 A geometric porcelain mug brings the age old tea drinking tradition into the 21st century. 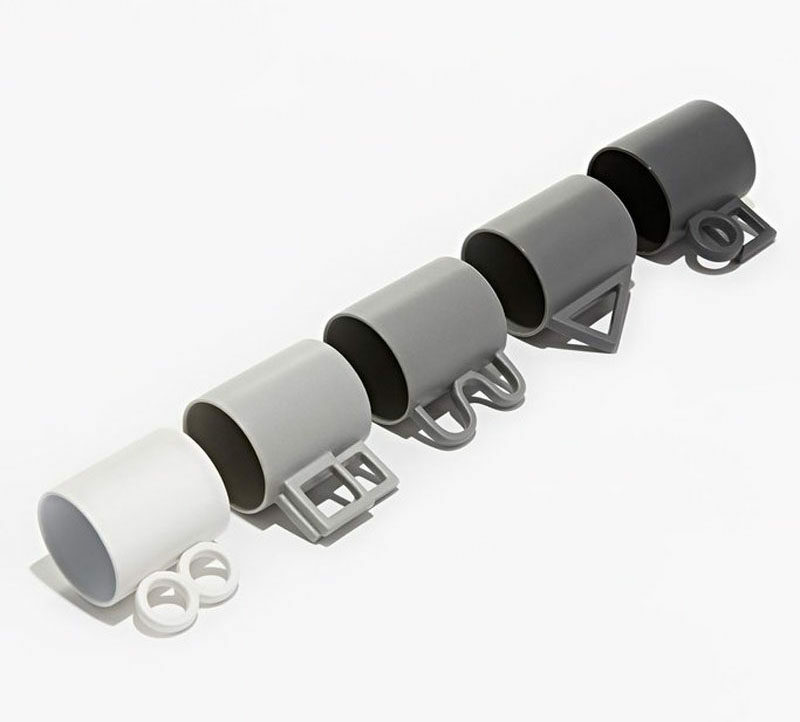 With their geometric handles, these mugs are perfect for modern minimalists who enjoy nice cup of tea any time of the day. 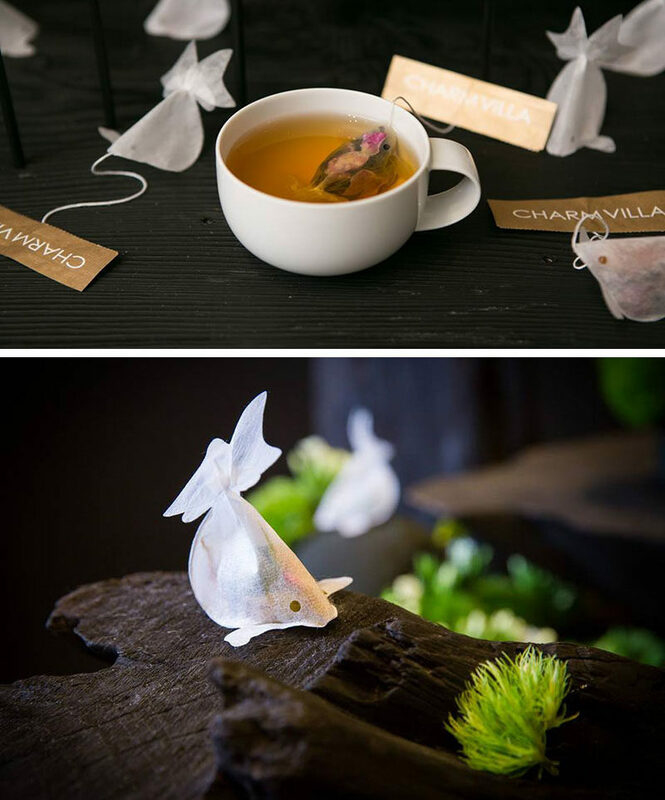 These fish shaped tea bags come to life when immerse in hot water and you keep you company while you sip on your daily brew. Find out more about them here. Created by Charm Villa. 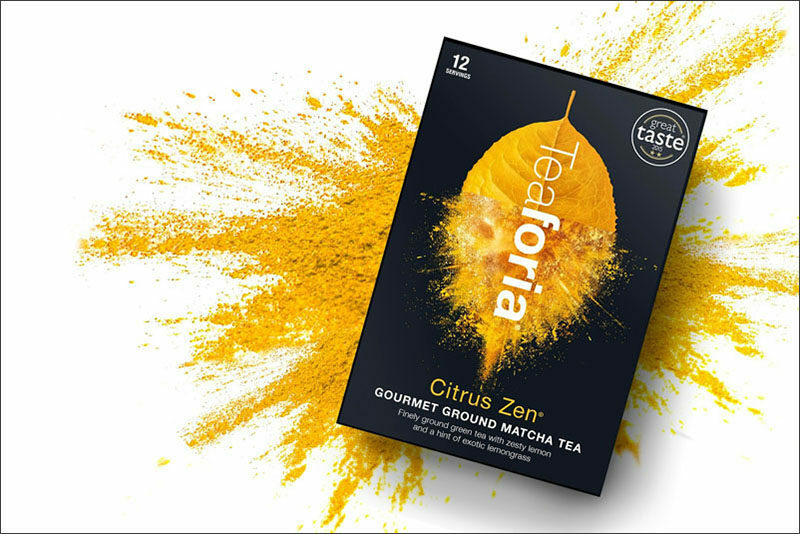 These well designed packaged teas are finely ground so that they dissolve in water, eliminating the need for an infuser or tea bags. 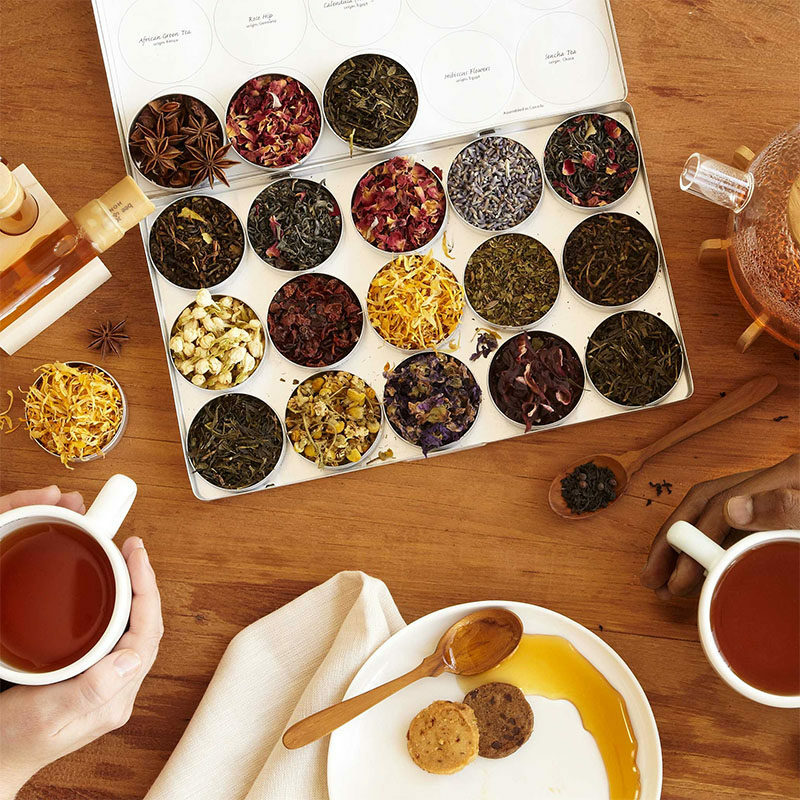 This tea gift set has an array of nine herbs and three varieties of eco-certified, organic green tea from Japan, India, and Sri Lanka, as well as reusable tea bags. Green Herbal Tea Kit by Julie Pedersen, available at uncommongoods. 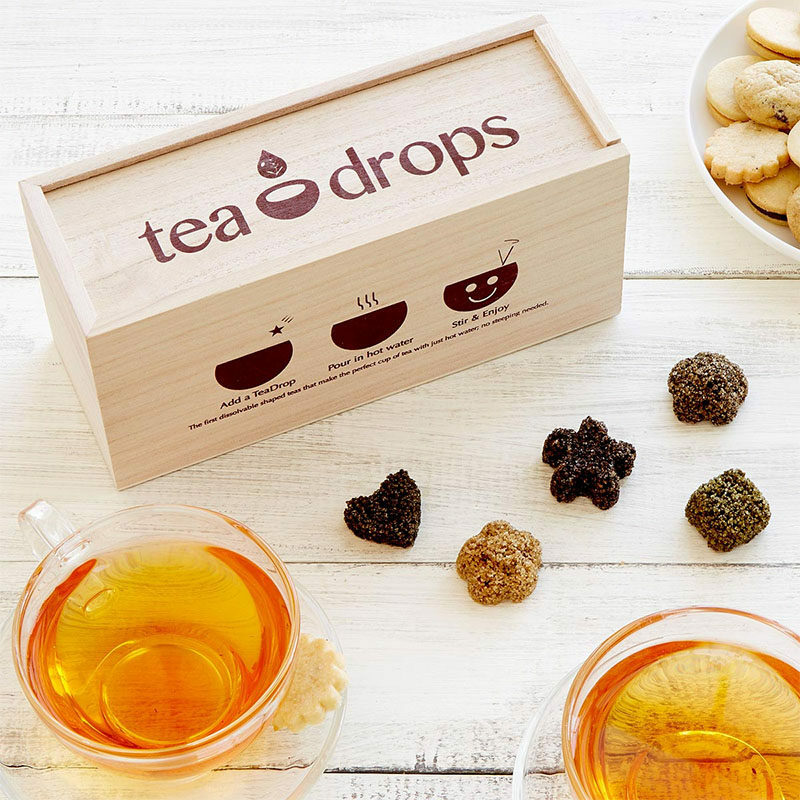 These cutely shaped tea drops simple dissolve once you put them in hot water. Tea Drops by Sashee Chandran, available at uncommongoods. 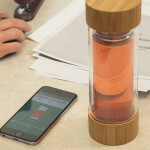 Never worry about leaving your infuser in too long with this nifty gadget. 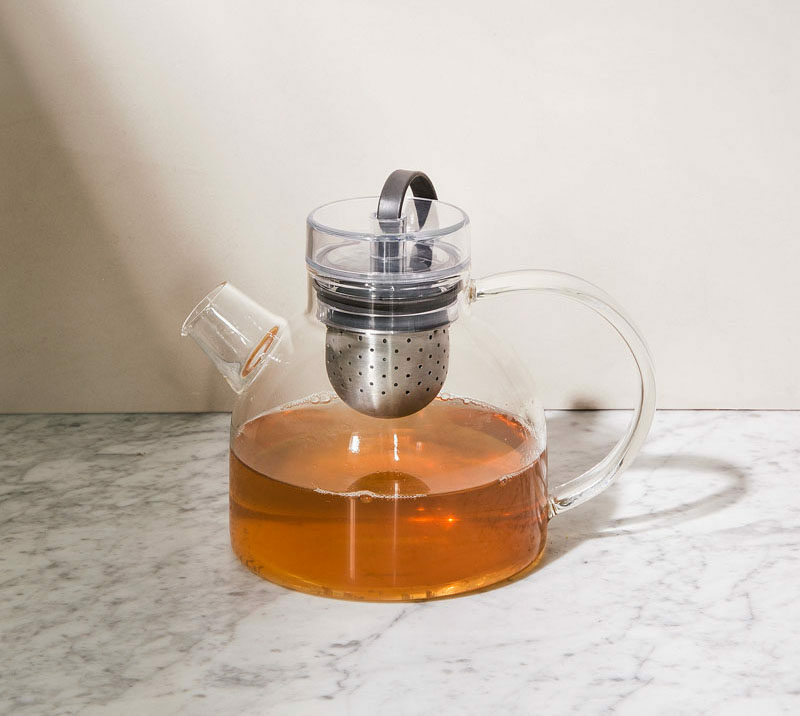 Once you’ve achieved the perfect flavor, simply press down on the top of the infuser to seal the holes to prevent your tea from becoming bitter or over flavored. 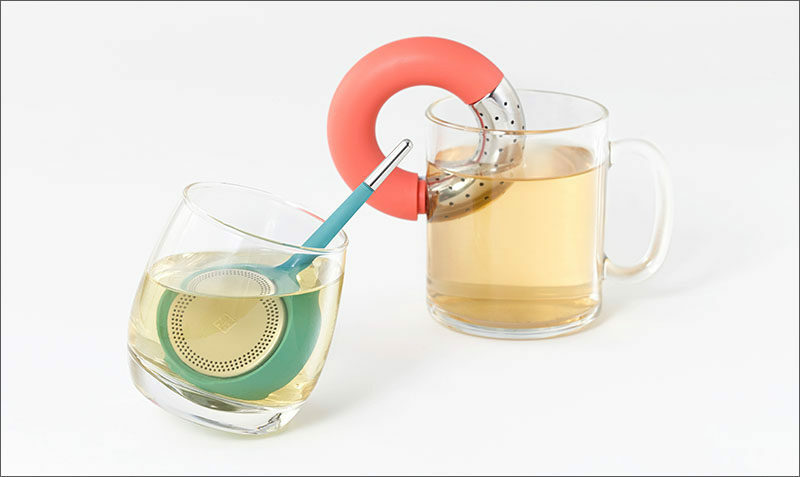 Brew tea in style using these matte colored infusers designed for easy stirring and convenient clinging. Find out more about them here. Designed by Ponti Design Studio for Ommo. This silicone infuser sits propped on the top of your to help you achieve optimum flavor no matter how big or small your mug may be. 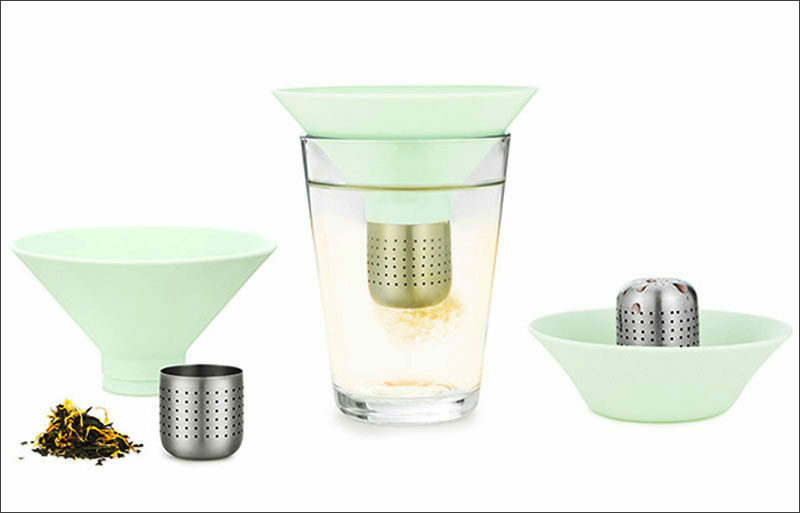 Brew a strong cup of tea in this simple glass cup that puts you in control of the entire tea making process. 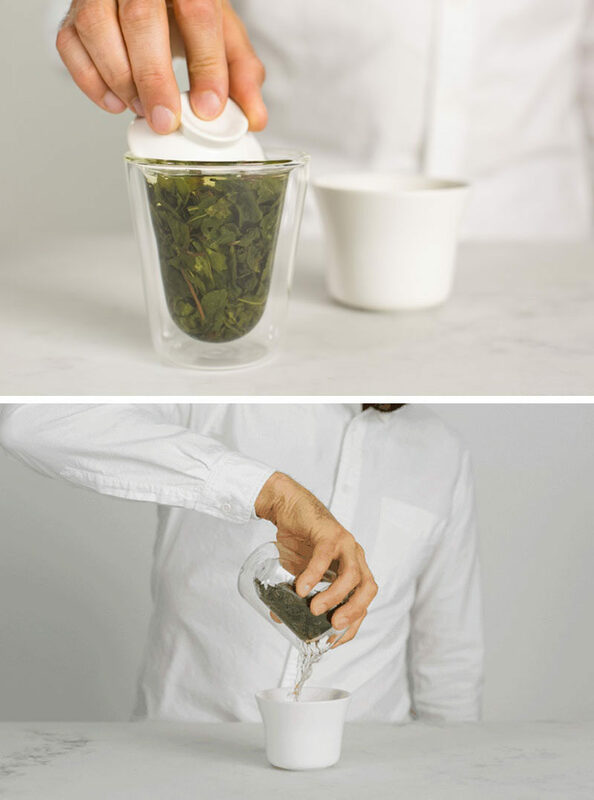 Measure just the right amount of tea every time using a sleek measuring spoon that helps make sure you don’t use too much or too little of your favorite loose leaf. Blomus tea scoop, available at 2Modern. 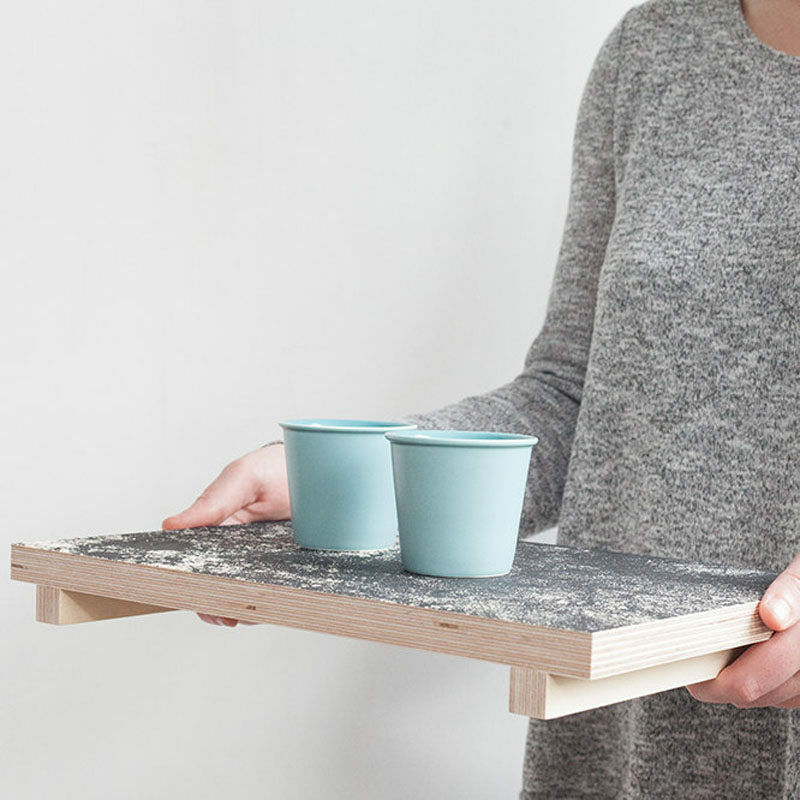 Enjoy your cup of tea from the comfort of your bed, your floor, your living room, or anywhere really, with this tea tray. 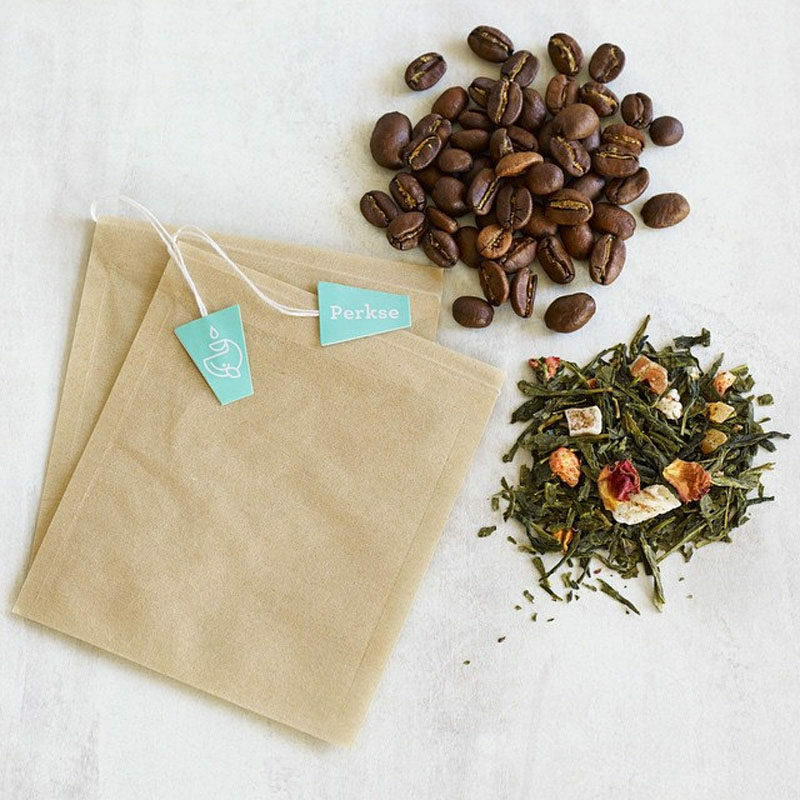 Put your loose leaf teas into convenient tea bags so you can enjoy your tea any time, any where without having to lug around the whole container of tea. 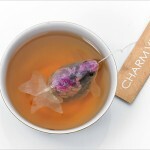 Tea Bags by Perkse Tea. 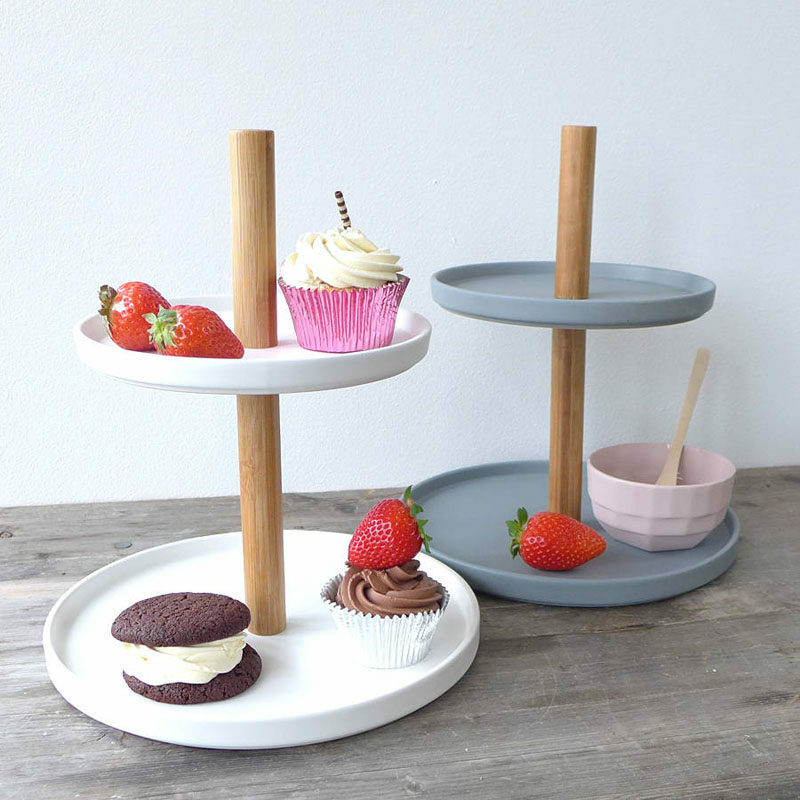 Take your tea party to a whole new level by serving pastries on a contemporary cake stand. Ceramic and Wood Etagere Cake stand from Lilac Coast.